The spice and tang of the Theeyal beautifully complements the coconut and curd based sweetish curries like Avial and Kaalan in the feast. 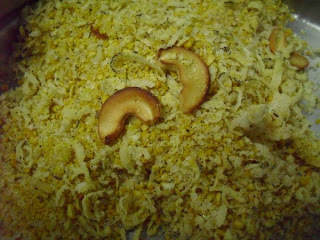 My family likes to savour Theeyal ( Puli Kozhambu ) with steaming hot rice topped with a spoon of fresh ghee. Similar to Puli Inji, Theeyal can also be enjoyed with curd rice. A lick of Theeyal is very refreshing after binging on Paruppu Paayasam and Nendirampazha Halwa ! 1. Dry roast the coconut gratings on low flame till it turns light brown in colour. 2. Remove the roasted coconut on to a plate and add oil to the same kadai. 3. When the oil is hot add the coriander seeds, Bengal gram dal and red chillies. 4. Roast the ingredients on low flame till they emanate a pleasant aroma. 5. Cool all the roasted ingredients and grind them into a slightly coarse powder and keep aside. Tamarind - the size of a big lime. 1. Soak tamarind in warm water, and extract the thick juice and keep aside. 2. Peel and slice onion into long slivers. 3. Wash and chop bitter gourd into one inch long strips. 4. Heat oil in a kadai and add the mustard seeds. 5. When the mustard seeds splutter reduce flame and add the fenugreek seeds. 6. 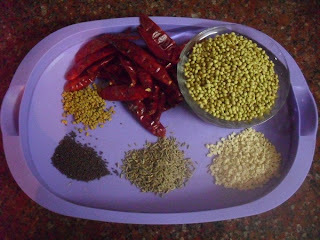 Add asafoetida when the fenugreek seeds become reddish in colour. 7. Immediately add broken red chillies and then the ginger, and curry leaves. 8. When the seasoning is ready add the chopped onion and bitter gourd. 9. Saute for a few minutes and cover and cook on low flame. 10. When the vegetables are almost done add turmeric powder and the presoaked Chickpeas. 11. Stir for a couple of minutes and pour the tamarind juice into the kadai. 12. Add jaggery, salt and sambar powder and let it cook on medium flame till the raw smell is gone. 13. Finally mix in the Theeyal podi and cook for a few more minutes till the oil separates. Enjoy the Ulli Paavakka Theeyal along with the other Onam sadya dishes. A lot of time, a lot of patience and a little bit of innovative mind are the accessories required to prepare an elaborate festive meal. While sweets, chips and pickles are usually prepared beforehand to save time, side dishes like appalams, fruit salads and pachchadis are reserved as the last minute items to be prepared. 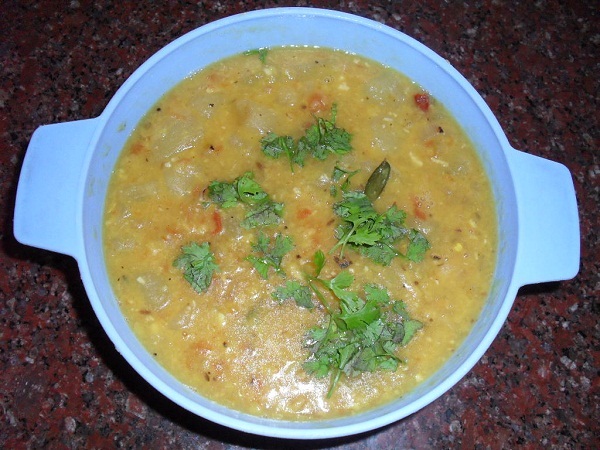 Appalam Thair Pachchadi is one such last minute side dish usually prepared in a hurry. The innovative cook grabs a few fried appalams. Crushes them, and mixes them with curds and a portion of the unused coconut paste prepared for the Koottucurry. There! An instant and delicious Appalam Thair Pachchadi is ready, as the banana leaves are being spread out for the feast! 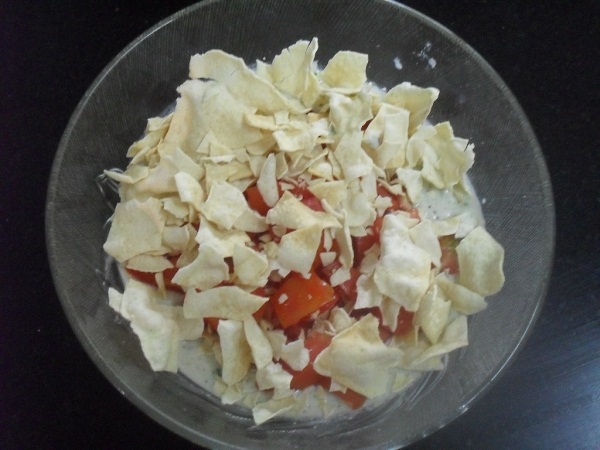 Here is a recipe for a delicious Appalam Thair Pachchadi with a simple makeover using a few extra ingredients. 1. Wash and chop tomato finely. 2. 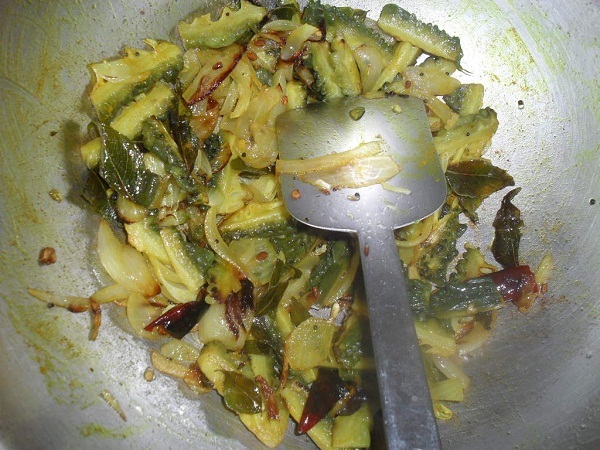 Grind coconut gratings, green chilly, salt, fresh ginger and fresh coriander leaves into a smooth paste. 3. 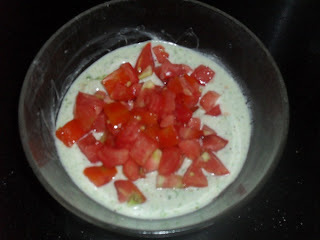 Combine the coconut paste, tomatoes and the curd gently. 4. 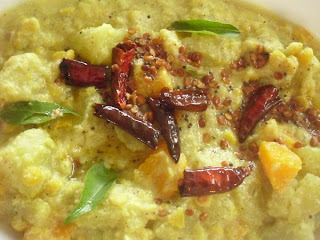 Heat the oil, splutter the mustard seeds and pour over the pachchadi. 5. Crush the fried appalams and mix into the pachchadi just before serving. 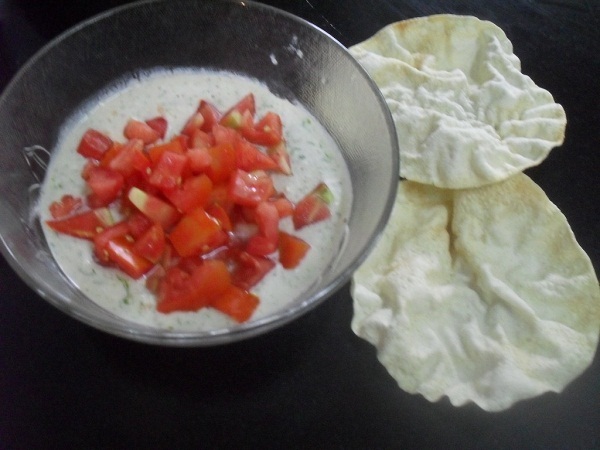 Enjoy the crunchy Appalam Thair Pachchadi with the rest of the Onam Sadya delicacies. I have always been interested in food related topics that cropped up during conversations among family members and friends. 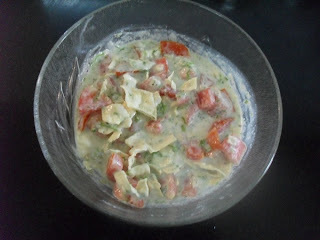 After I became a food blogger my interest in traditional recipes intensified double fold. I picked up some Kerala recipes from my Sambandhi (son - in - law's mother) during a casual chat, when she rattled off about her childhood in Kerala and about the festivities and the delicacies of God's Own Country. 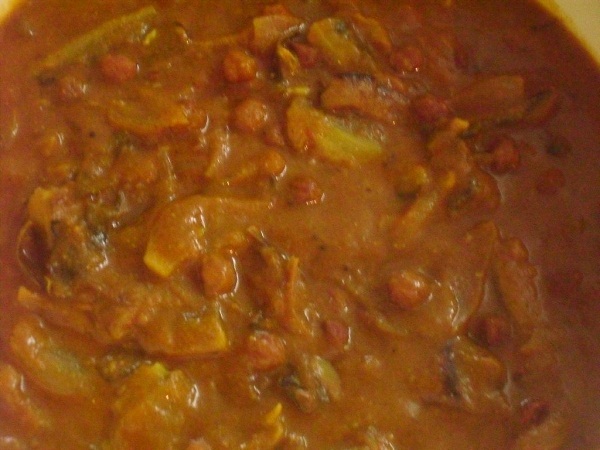 Here is a simple yet delicious recipe of Koottucurry which is one of the numerous curries traditionally prepared for the Onam Sadya during the festival of bounty called 'Thiruvonam'. 1. Wash, peel and cut the chow chow and carrots into big cubes. 2. Wash and drain the Bengal gram dal and add 1 1/2 cups of water and turmeric powder. 3. Top the dal with the cubed vegetables and pressure cook up to three whistles. 4. In the mean while grind the fresh coconut gratings, green chillies, cumin seeds and rice flour together into a smooth paste. 5. 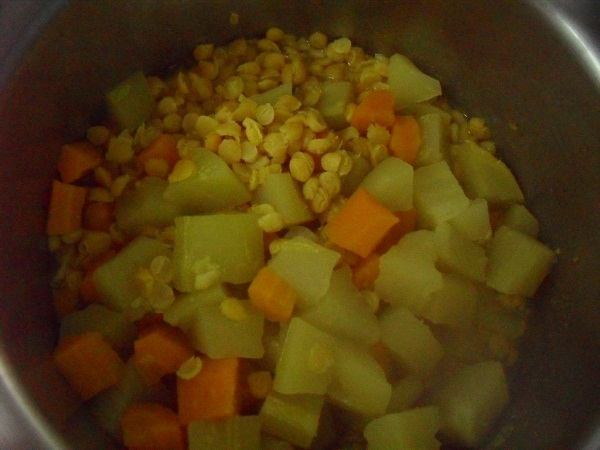 When the pressure subsides remove the cooked dal and vegetables from the cooker. 6. 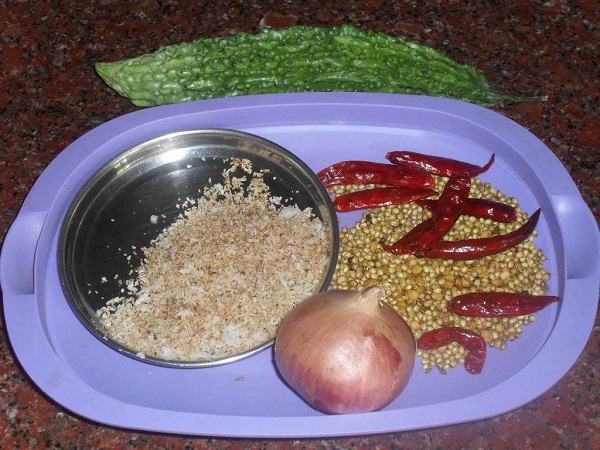 Add the ground coconut paste, salt and curry leaves, and cook till all the ingredients blend well. Take care not to mash the dal too much. 7. Heat the coconut oil and add mustard seeds. 8. When the mustard seeds splutter, reduce flame and add the black gram dal and fry till it turns golden in colour. 9. Add the broken red chillies and fry till the chillies become crisp. 10. Pour the seasoning over the Koottucurry. Enjoy the delicious Koottucurry with the sumptuous ONAM SADYA. Most of the foodies in South India are Rasam fanatics. My family is no exception. We enjoy tall glasses of piping hot rasam as starters at multi cuisine restaurants before we indulge in a North Indian or even a Chinese meal ! A bowl of hot rasam rice is ambrosia when one is laid up with fever or cold. Just one spoon of rasam rice is enough to make the dead taste buds spring back to life.The noisy slurps of a delicious rasam rice is real bliss. One of the most delicious rasams adored by my family comes from the temple town of Udupi. 1. Dry roast mustard seeds and fenugreek seeds on low flame. 2. When the mustard seeds start spluttering and the fenugreek seeds turn reddish in colour remove them on to a dry plate. 3. Roast cumin seeds similarly till you get a pleasant aroma and remove it into the same plate. 4. 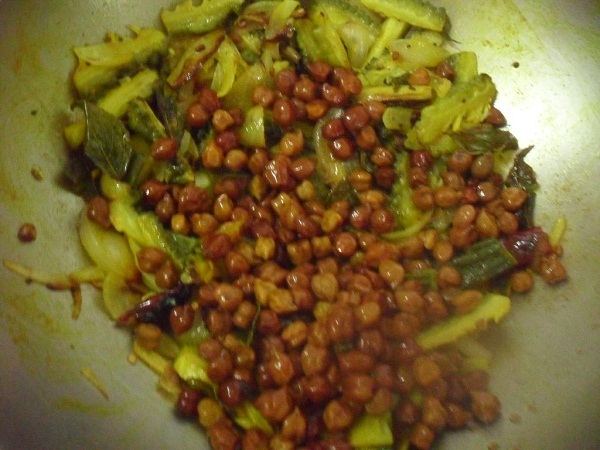 Heat oil in the same pan and add coriander seeds, black gram dal and red chillies. 5. 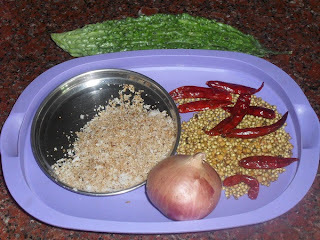 Roast them together till the ingredients emanate a pleasant aroma and the chillies become crisp. 6. Remove the roasted ingredients on to a plate and allow to cool. 7. When all the ingredients are cooled grind them together into a slightly coarse powder. 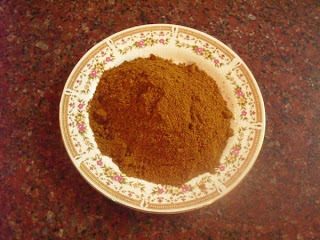 The Udupi Rasam Powder is now ready. Store in a clean air tight jar and use it up within a week. 1. Soak tamarind in warm water and extract a thick juice and keep aside. 2. Pressure cook toor dal with chopped tomato and chopped green chillies adding turmeric powder and 2 cups of water. 3. Add salt, jaggery, asafoetida powder, fresh coconut paste and curry leaves to the tamarind juice and boil for five minutes till the raw smell of the tamarind is gone. 4. Remove the pressure cooked ingredients, mash well using the back of a ladle and pour it into the boiling tamarind mixture, and continue to cook till the ingredients blend well. 5. 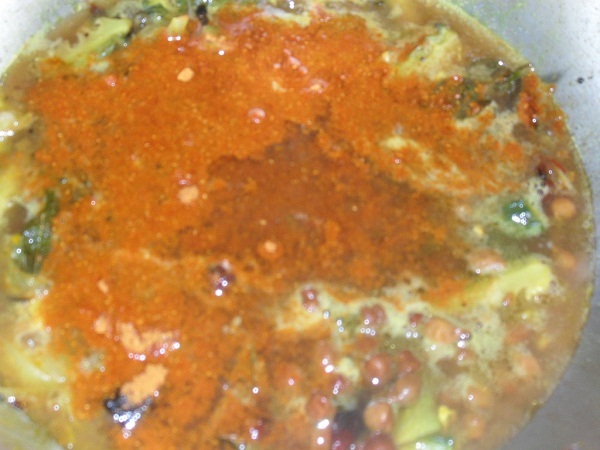 Stir in the rasam powder avoiding the formation of lumps and simmer for two minutes. 6. Add 2 glasses of water in a slow and steady stream till the rasam becomes foamy. 7. Reduce the flame and top the rasam with fresh coriander leaves. 8. Cover with a lid but keep checking till the rasam starts to simmer again. 9. 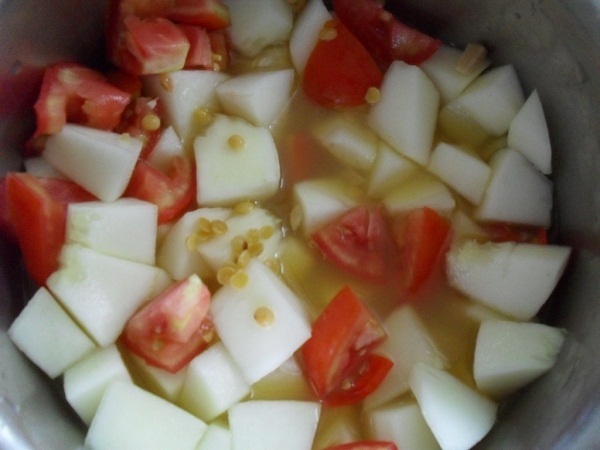 Switch off flame as soon as the rasam reaches boiling point and starts rising. Enjoy the hot and flavoursome Udupi Rasam in a tall glass or stir well and savour it with steaming hot rice.In both cases do not forget to top it with a spoon of fresh ghee. 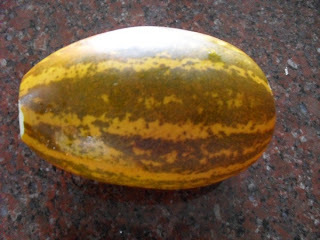 I have seen the Golden Vellarikkai during Vishu festival at my daughter's place. But I started cooking this Mangalooru Southekai only after a young niece of mine from Hyderabad, gave me a recipe using Field Marrow ( known as Dosakaya in Telugu). I prepared a luscious Mangalooru Southekai Tovvae using her recipe! 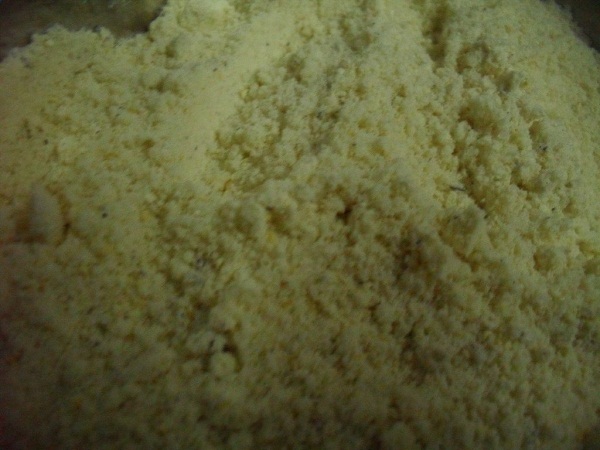 Asafoetida Powder - 1 pinch. 1. Peel and cut the Field Marrow lengthwise. 2. Scoop out the seeds and cut it into big cubes. 3. Chop the tomatoes and keep aside. 4. Heat a teaspoon of ghee in a kadai and roast the dal till you get a pleasant aroma.Switch off the flame and remove the roasted dal into a cooking vessel. 5. Pressure cook the roasted dal, cubed Mangalooru Southekai and chopped tomato in 2 cups of water adding turmeric powder and chopped green chillies. Allow to cool. 6. Heat the remaining ghee in the same kadai and add mustard seeds and cumin seeds. 7. When the mustard seeds splutter add urad dal and fry till golden in colour. 8. Add asafoetida and then the the red chillies. 9. 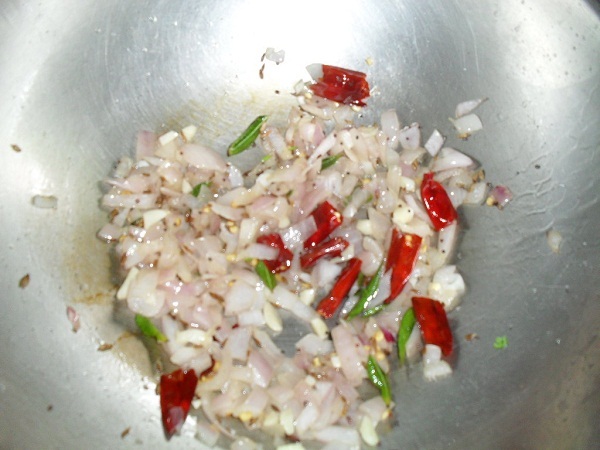 When the chillies turn crisp add the curry leaves,chopped onion and garlic and saute till the aroma comes out. 10. Add the fresh grated coconut and fry for a few more seconds. 11. 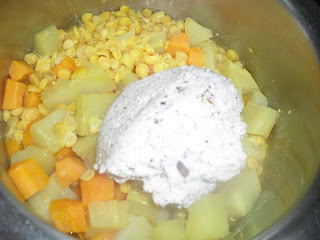 Remove the cooked dal and vegetable from the cooker, mash lightly using the back of a ladle and add it to the seasoning. 12. Add salt and keep cooking till all the flavours blend well. 13. When the tovvae is thick enough switch off the flame and garnish with fresh coriander leaves. Enjoy a bowl of steaming hot Mangalooru Southekai Tovvae as it is or relish it with rice or chapaties. 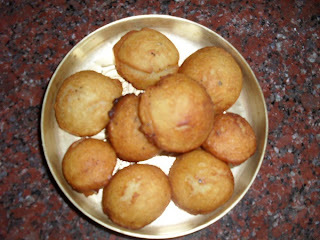 Appa is another sacred sweet offered to Sri Krishna at Udupi. 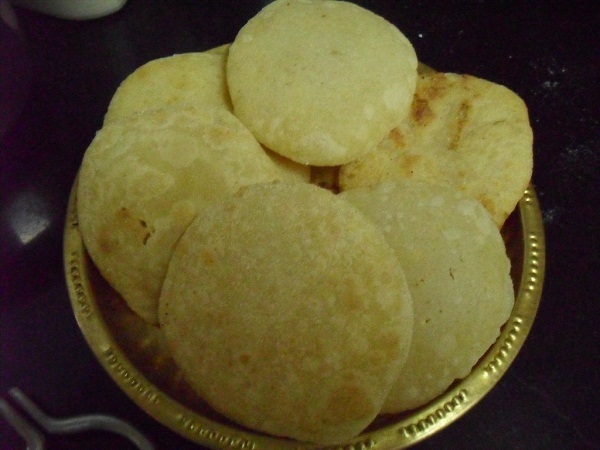 It is customary to prepare godumai (wheat) appam for Kaartigai. This year I have decided to offer Appa , prepared with rice flour to celebrate Sri Krishna's Janmaashtami. 1. 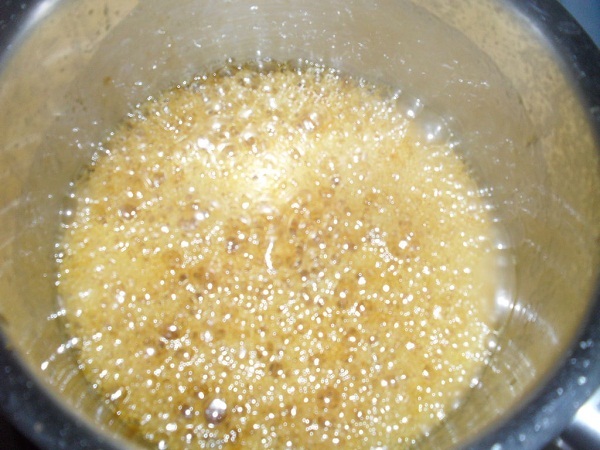 Dissolve jaggery in half a cup of warm water, filter and cool. 2. Mash the bananas and add to the jaggery water. 3. Add cardamom powder and mix in the rice flour little by little to make a smooth and thick batter. 4. Add the minced coconut pieces to the batter and mix well. 5. 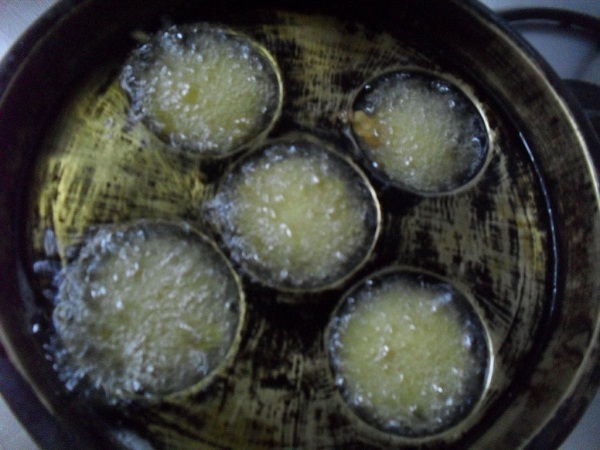 Heat oil in the Appam pan. 6. 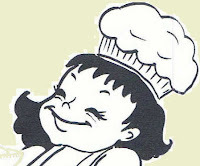 Pour a ladle of batter in each hollow portion of the pan. 7. Cook till the Appa turns golden around the edges. 8. Use a spoon and flip the Appas when they start floating in the hot oil and cook till they become golden on all sides. 9. Carefully remove the Appas one by one and drain on a paper towel. Offer the plump and delicious Appas to baby Krishna and enjoy the Prasaadam. 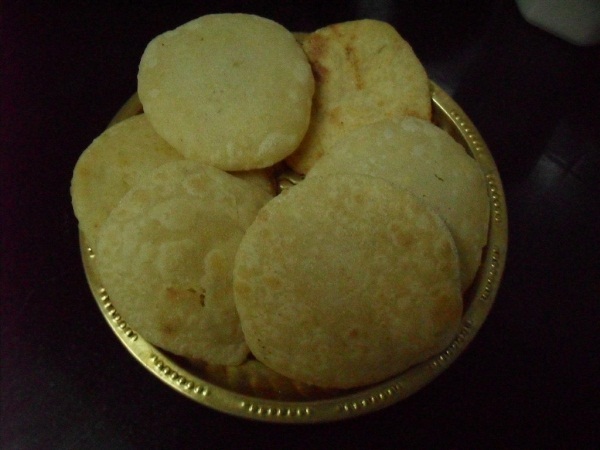 Pancha Kajjaaya is another Udupi Speciality offered to Udupi Sri Krishna.The ingredients were quite visible and it was very easy to prepare it after tasting the special prasaadam from the bag of Sampoorna Prasaadam from Udupi. 1. Heat a drop of ghee in a pan and add the Bengal gram dal. 2. Roast the dal till it becomes golden in colour giving out a pleasant aroma. 3. Cool the roasted dal and grind it into a coarse sand like powder. 4. Mix the coarse dal powder, grated copra,sugar and cardamom powder in a bowl. 5. Heat the remaining ghee and fry the cashew nuts to a golden colour and mix with the ingredients in the bowl. Offer the crunchy and flavoursome Pancha Kajjaaya to the little Lord on His Janmaashtami and relish the blessed prasaadam. 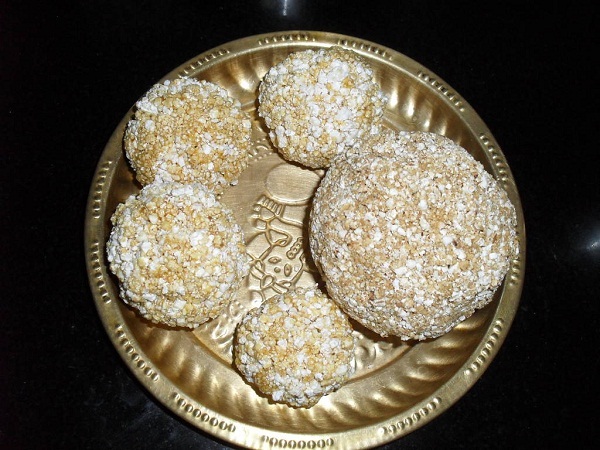 Gullorige is a special sweet offered to Udupi Sri Krishna which tastes like a sweet coconut cookie. Like all other children, the Divine Baby too loves this fried coconut cookie. 1. Grind roasted gram, sugar and cardamom together into a powder. 2. Add the dry coconut gratings and run the mixer for a few seconds so that the filling remains coarse. 1. Rub ghee and salt into the fine semolina. 2. Add warm water little by little and knead it into a soft dough. 3. Cover and leave it for one hour. 4. 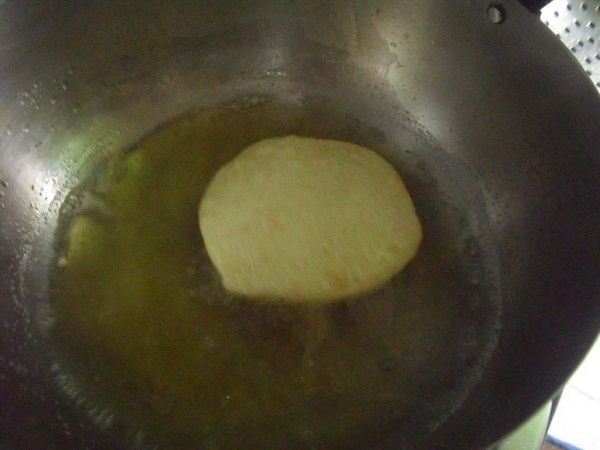 Take out a small ball of the soft dough and roll into a thick poorie. 5. Place a table spoon of the filling and draw the edges of the poorie together to cover the filling, and press down to seal. 6. 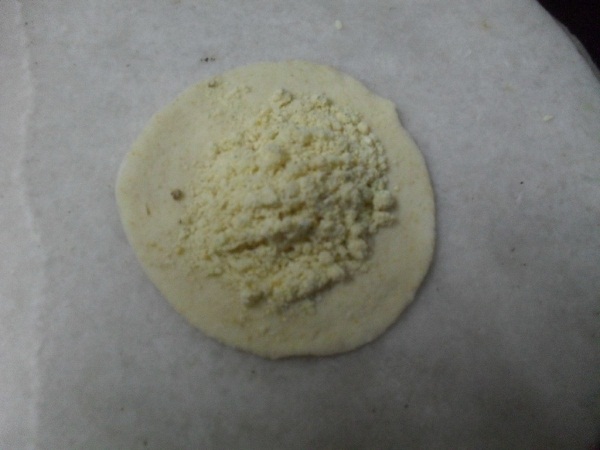 Place the sealed side down and lightly roll into a thick poorie dusting with flour if necessary. 7. Roll out all the dough into stuffed gulloriges and cover with a wet cloth. 9. Slide one or two gulloriges into the hot oil and reduce the heat. 10. Press down using the perforated ladle so that they do not puff up and fry till the colour changes. 11. Flip and fry on both sides increasing heat. 12. Fry till the gulloriges become crisp, remove and drain. Offer Gullorige - the sweet coconutty cookie - to baby Krishna on His happy birthday. The divine taste and flavour of Prasaadams of the age old temples in India have remained constant through out many centuries. In all these years the ancient methods of cooking the prasaadams for the presiding deities have been strictly adhered to. The secret formulas of the ingredients used, and the methods used for preparing the prasaadams set by the ancestors eons ago have been safely guarded even to this day. It is not an exaggeration to say that the ancient temples of India are repositories for a number of traditional Indian recipes. My daughter's family came back with a bag of Sampoorna prasaadam from Udupi recently. 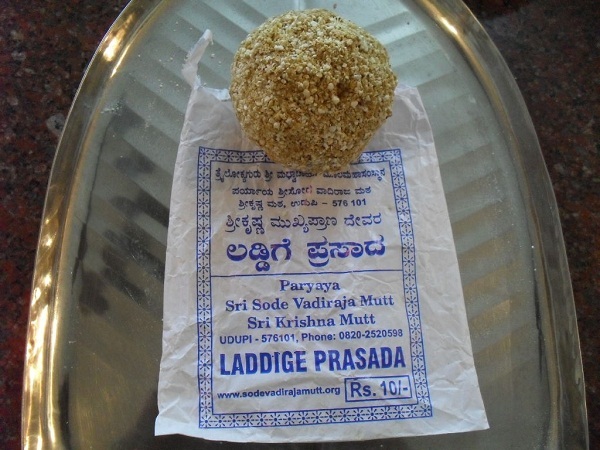 The taste of the prasaadams of Udupi Krishna was something out of the world.The names of the sweets which were printed on the cover stirred my curiosity to learn more about them. 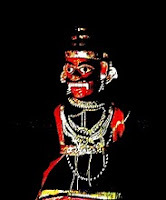 I found this link where in all the prasaadams offered to Udupi Krishna are listed in detail. 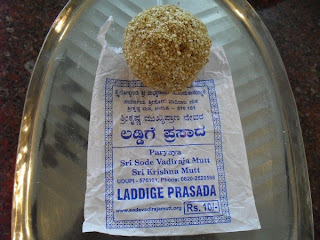 Laddige is one of Udupi Krishna's favourite Prasaadams. 1. Clean the puffed rice and coarsely grind in the mixer for only a few seconds. 2. 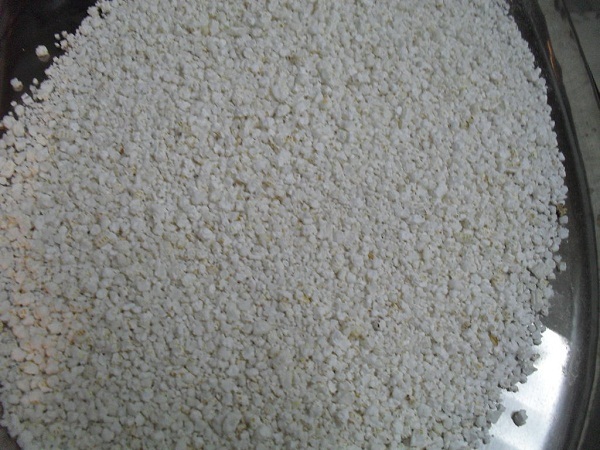 Take out the puffed rice pearls in a greased bowl or plate. 3. Crush and dissolve jaggery in 1 glass of warm water. 4. 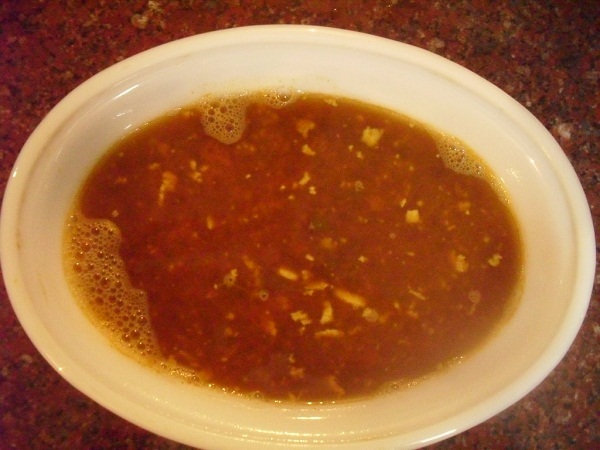 Filter the jaggery water and boil it up to one thread consistency in a sauce pan. 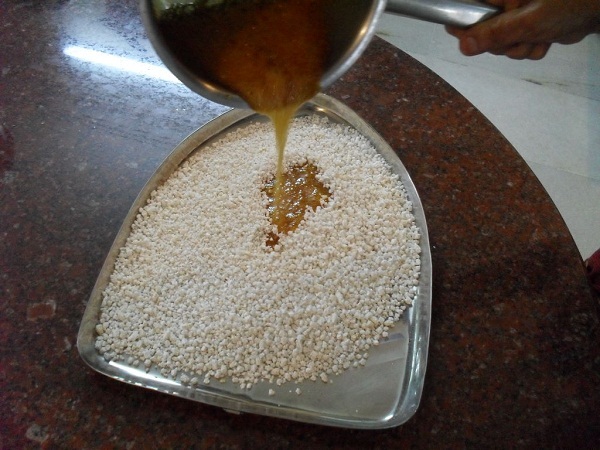 5.When the syrup becomes sticky and starts foaming add cardamom powder and pour it all over the puffed rice pearls. 6. Mix well using a spatula. 7. Grease your fingers, scoop out a ladle of the sweetened puffed rice and make it into a big ball.Use up the entire sweetened puffed rice pearls to make more Laddiges. Offer the golden balls studded with small white pearls to Sri Krishna on Janmaashtami and savour the prasaadam. I could make four Laddiges with the quantity of ingredients given above and they looked like mini laddiges in comparison with the huge Laddige Prasaadam from Udupi.